Can humanity heal without dependence on antibiotics or other drugs? FAB Health introduces a new healing paradigm encompassing light, frequency and bioenergy as an alternative to antibiotics and other drugs. 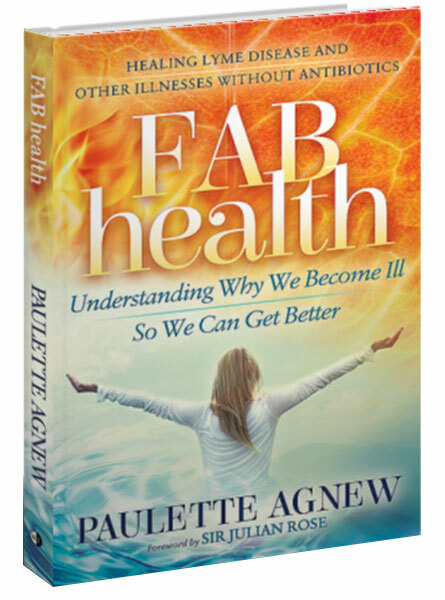 Using only FAB (Frequency and Bioenergy) medicine, Paulette Agnew completely recovered from Lyme disease not once, but twice coming back from the brink of death to radiant health. Agnew’s trailblazing discoveries induce healing and awaken true power and potential. Readers are drawn into a breathtaking quantum world, which combines ancient medicine, spiritual laws and cutting-edge research. Fab Health reveals why and how disease develops and offers inexpensive strategies for eradication—a boon to many who have been searching for answers.